AnswerFirst Answerin Services Booth at the Florida Bar Midyear Meeting in Orlando, a photo by AnswerFirst on Flickr. AnswerFirst Communications is currently attending the Florida Bar Midyear Meeting at the Walt Disney World Resort Hilton in Orlando, Florida. The organized bar in Florida began in 1889 with a small group of lawyers but officially became the Florida Bar in April of 1950. Today, the bar is a statewide professional organization of lawyers that serves as a guardian for the integrity of the legal profession; the Bar also serves an advocate and intermediary for attorneys, the court and the public. The Midyear Bar Meeting is an annual gathering of bar members including lawyers, judges and other legal professionals; the event provides committees, bar members and sections an opportunity to meet midyear to carry out goals, while also serving as a networking and educational environment for members and other attendees. 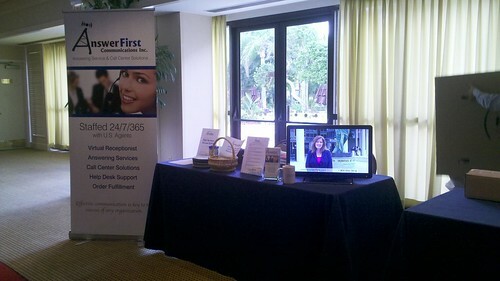 AnswerFirst is attending the 2011 Florida Midyear Bar Meeting as an exhibitor with the intention of marketing their answering services to the hundreds of attorneys at the meeting. AnswerFirst Communications, Inc. is based in Tampa, FL and provides answering services, virtual receptionist and call center solutions to more than 1400 customers around the globe. For more information about AnswerFirst's answering service and call center solutions please visit their website or call Teri Erickson at 1-800-645-2616. AnswerFirst provides answering services and call center solutions to more than 1400 companies around the globe but what sets AnswerFirst apart from other services? Our call center is staffed with U.S. agents 24/7/365 and a manager onsite at all times so that our clients receive the same level of service that we provide their callers. Talk to a real person instead of a robot. http://www.answerfirst.com 1-800-645-2616. How Do You Know That Our Operators Will Answer Your Business Calls Quickly? This is a matter of motivation; how critical is it for us to make sure this happens? You only need to look at how our answering services are billed to determine whether or not we are highly motivated to answer your calls quickly. With many services you pre-buy a block of calls or minutes, in which the call center receives payment prior to answering any of your calls. We don't offer these types of rate plans, so it's easy to see why we are motivated to answer your calls. With our answering service rate plan only the base fee ($5 per week) is guaranteed to us, we earn additional monies only when we answer your phones and help your callers. This rate structure provides a tremendous amount of motivation to answer calls quickly and professionally. Frustrated callers, who hang up in a hold queue, are lost revenue for us. You can rest assured that we pay a lot of attention to proper staffing and timely responses to your incoming calls. AnswerFirst is based in Tampa, FL and provides answering services, appointment scheduling, reservation taking, technical support, customer care, order entry andcontact center solutions to more than 1400 businesses in many industries throughout the world. For more information about their services visit their website or contact Teri Erickson at 1-800-645-2616.